Graag nodigen wij u uit op deze ruime en onlangs gerenoveerde woning met 3 slaapkamers op de begane grond in de directe nabijheid van Spruce Meadows (6 minuten rijden) met voldoende parkeergelegenheid aan de voorkant van het huis. Voor het bijwonen van Calgary Stampede, het pand is op loopafstand van de C-trein die u in 25 minuten rechtstreeks naar Stampede Grounds zal nemen. Het pand is ook dicht bij Shawnessy winkelcentrum - een van de grootste outdoor winkelcentra in Calgary, dat meer dan 100 winkels en winkels, waaronder Walmart, Superstore, Home Depot, Canadian Tire en vele anderen biedt. - opgewaardeerde keuken met prachtige quartz aanrecht en roestvrijstalen apparaten. Alle keukengerei en potten, evenals basisspecerijen zijn ook aanwezig. - 3 mooie ruime slaapkamers - een met een koning slaapkamer set, 2e slaapkamer met een koningin slaapkamer set en de 3e slaapkamer met slaapbank die converteert naar een queen bed. - voldoende parkeergelegenheid aan de voorkant van het huis. Het heeft ook een eigen terras met een barbecue en een outdoor dining set voor de warme zomerdagen. A very comfortable immaculate clean home. 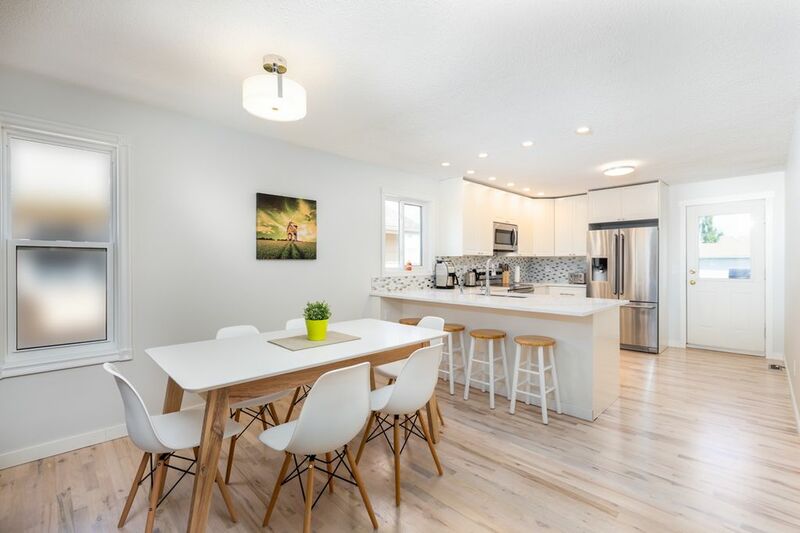 The kitchen is lovely, and the location is great to avoid Calgary's busy traffic. It was exactly what we were expecting. Nice good sized main floor unit, stocked with whatever we needed. Did not have much interaction with the owner, because there was nothing to discuss. Iryna the owner allowed us a late check out - which for us was great as 2 of our group were not flying out until later. Thank you we will return. We stayed at Iryna's place for almost 3 weeks coming from the Netherlands and we couldn't have been more pleased. The house was very clean upon arrival. The 2 bedrooms were very spacious and the couch in the den worked really well for a bed too. The beds were nicely made, clean towels etc..
Having a good washer & dryer plus the use of a massive kitchen was wonderful. The house is located close to Shawnessy shopping and it was perfect for us to host friends and family. Thank you Iryna for a wonderful stay and we sure will be back! My family was very pleased with this rental. For the price - it is a great 2 bedroom plus den. We enjoyed the full sized dining table (seats 6) and the sofa/loveseat/armchair (seats 6-7). I didn't know the bottom suite was also rentable - I would be interested in renting out the top and bottom portion in the future. We didn't really hear the guests below us - a large rug covered the one source of noise entry (which was a great idea). The owner was quick the answer questions via email. Overall this was a positive experience. Things we wished we had: a measuring cup container, more dish towels, more garbage bags, one more cookie/baking sheet. This is a clean, well equipped home, exactly as advertised. Owners were very accommodating and quick to respond to inquiries.